Dropbox, the file storage and synchronization service, has become an essential part of many people’s workflow in the years since the service’s 2008 launch. The service frequently updates its feature, but its recent major 2.0 update goes beyond that—changing the desktop interface to make accessing the Web service easier and to make sharing items faster and more obvious. The new Dropbox client has buttons for opening local and Web-based views of your Dropbox. It shows you recently shared and recently changed files, with file icons providing a bit more information. Preferences appear in a submenu, as does the Dropbox space used. When you sign up for Dropbox, you must download and install client software on each computer that will access your Dropbox. Client software is available for all major desktop and mobile OSs, and on the Mac, the client appears in your menubar. 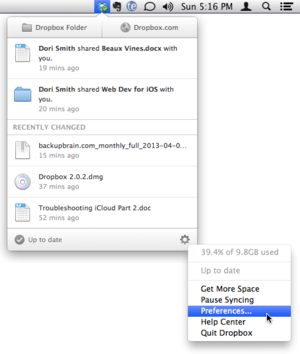 The software creates a Dropbox folder on your computer; and from then on, the file and folder contents of your Dropbox are automatically and transparently synchronized from your machine—up to the Dropbox servers on the Internet, and down to every other machine with access (machines on the same network copy files over your network for the best speed, but they also sync to the service). Just save or change a file or folder inside your Dropbox folder, and the changes will be distributed to the rest of your machines. You get 2GB of free storage to start, and you can add more free storage by referring friends, up to a maximum of 18GB. Dropbox also offers paid storage tiers, as well as a version with special features for teams. Dropbox’s complete Web interface allows you to download, delete, and work with items; show their history; and even restore previous versions. You can use the Web interface to share files or folders in your Dropbox with one or more people. The new client software improves the menu in several ways. When clicked, the two buttons at the top open the local Dropbox folder and the Web interface, respectively. Below that information is a brief list of the last few items other people have shared with you, followed by a Recently Changed list; both sections now sport file icons indicating what sorts of files they are. At the bottom of the menu, a status indicator tells you whether the service is syncing or is up-to-date, and a gear menu leads to the listing of available space in your Dropbox and to Preferences. Easier sharing: You can now share recently changed files with a click of the Share button, which takes you to the Web interface to finish the process. When you roll over a recently changed item, a new Share button appears. Clicking that button launches your browser to finish the sharing process in the Web interface. 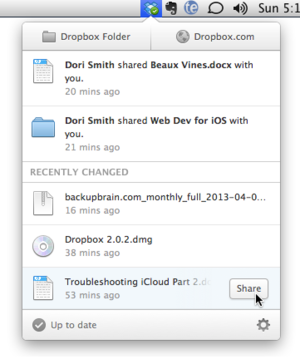 This is a useful addition because, even though collaborative sharing with other Dropbox users has been part of Dropbox for a long time, many people don’t know about it. I’m mostly pleased with the updated interface, though I wish that Dropbox had placed the space-used indicator in the status line, rather than in the Preferences menu (where checking available space takes an extra click). Disappointingly, the client programs still can’t tell you when they need updating; the software does automatically update, but the company often takes weeks to push out new versions. Dropbox’s effortless synchronization and backup make it one of the most convenient services for people who work on multiple machines—and a painless, lightweight backup system for your key documents. The updated client’s improved access to your local and Web Dropboxes makes things quicker, and the addition of the Share buttons to the menu items increases the likelihood that you’ll use this excellent but somewhat obscure feature. Dropbox's updated client improves access to your local and Web Dropboxes. The addition of the Share buttons to the menu items make it more likely this excellent but somewhat-obscure feature will get used.